The latest edition of the Islamic Fashion Festival took place on November 3rd, as part of Malaysia International Fashion Week. Here are a few beautiful photos from the show, check out the Calgary Herald for a few more. 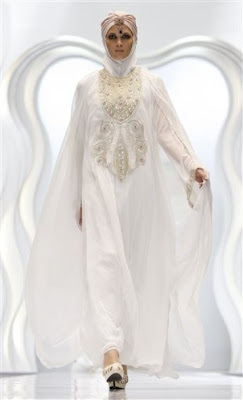 I love the abaya-cape combinations. I would buy those in a heartbeat! Malaysia Boleh! However some designs at the end were ridiculous..cover your face then show your legs..are you kidding? I have to agree with "C", but I liked the prayer outfits. Many were so beautiful. Beautiful colours and flowing fabrics.Wow! the models look stunning, i particularly like the blue silky flowing one. Those top two are gorgeous! Such creativity though. I wouldnt know where to wear such dresses but very beautiful! Hello; unrelated to this specific article. You don't have to post this message. I mean, sure you have a life and it's normal to be busy. Just wanted to let you know someone misses your (almost) daily posts.